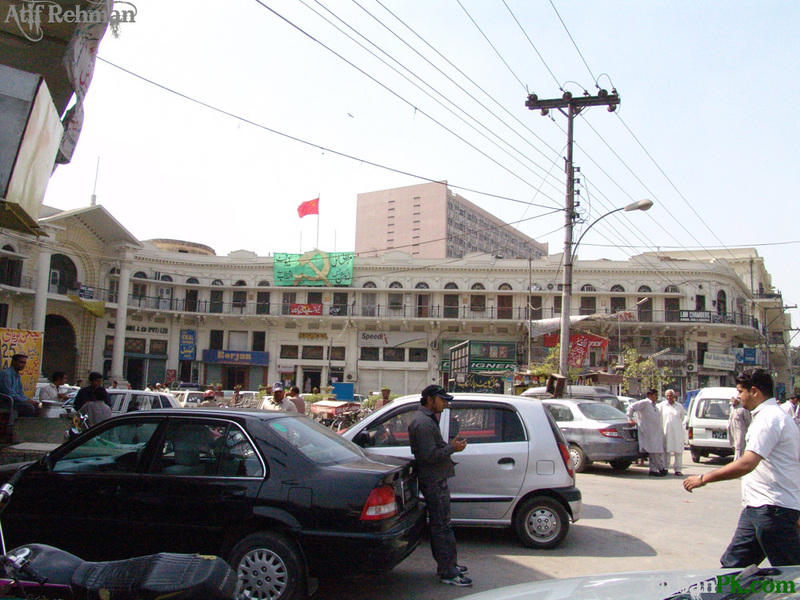 I was always surprised by the fact that the Pakistani Communist Party had such a prominent spot for their flag in Lahore, on the Dyal Singh Mansion on Mall Road (the picture is from the urbanpk.com Forum). The other Great Gamers sat further East (the Queen on Charing Cross) and West (Kipling’s Kim in front of the Lahore Museum) just some hundred meters up and down. When one talks about the Left in Pakistan (also when it talks about itself) one is pretty quick quite far on the left, with comrades and worker’s struggle. (To follow what the very active Leftists are currently up to, the SPN Network is a great source). That is a bit bewildering to a Central European who understands the Political Left to be more heterogenuous than just Socialist. There could be the Greens, the Liberals, and other swaths of the population who would be left leaning but has little understanding of peasant’s uprsie in the rural areas or reminescences of a Socialist state. Farooq Sulehria provides a brief history in a global context. When I invoke the term left, I do not mean left in the classical sense: a centralized communist party. I rather mean a loose coalition of like-minded Pakistanis with a socialistic outlook who believe in a secular public sphere and do not treat class, gender, and other identities as fixed but as fluid constructs within a national space. Most of all, the left signifies for me a strong commitment to a liberatory and redemptive politics that builds lateral solidarities—within and without the nation—against the forces of neoliberal capital. To become relevant to the real needs of Pakistan’s peoples, Pakistan’s leftists need to reaffirm their allegiance to what truly matters. Instead of chasing demons and indulging in meaningless sloganeering, they must squarely face religious militancy as the most immediate problem. Left-wing ideals lie in the great ideals of economic justice, secularism, universalistic ideas of human rights, good governance, women’s rights, and rationality in human affairs. Washington must be firmly resisted, but only when it seeks to drag Pakistan away from these goals. It is futile to frame every debate in pro- or anti-America terms; the key point is to be pro-people. A recent short article on where the Pakistani Left could go, which sees a lot of positive potential, was recently published by Qalandar Bux Memon and Ali Mohsin. Like the other articles it dwells a lot in the past, but gives current examples where the Left is active and achieving. From these foundations, the Left desires to push on to economic and social transformation. It’s a difficult, perilous task. But the Pakistani Left has never been more prepared. This rooting in the present gives this piece some more realistic outlook what the Pakistani Left could be about today (no doubt, the different organisations are very active and do achieve a lot good – it would be laudable if interantional ‘nation builders’/’failed state theorizers’ would acknowledge these aspects of the Pakistani landscape). Nevertheless I think the Left would be well advised if they would further their spectrum from staunch comrades, anti-imperialists and the working class to for example the neo-liberals in Raja’s definition. Memon and others are reaching out to bring different people together via great initiatives in locations like Cafe Bol – I guess there could be more of it, also outside of the universities’ domain.